Janet Musker taking part in a mountain bike event. ORIENTEERING WA is holding a mountain bike orienteering session at Kangaroo Valley near Karragullen on Sunday, June 25. Participants need to bring their own mountain bike and helmet, and map boards can be hired. 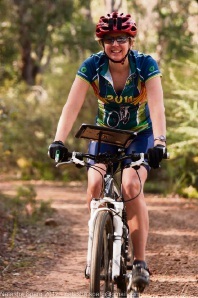 Orienteering WA’s Helen Post said the addition of a mountain bike to orienteering added an extra challenge to the event. “It’s trickier to read the map while riding than it is while running,” Ms Post said. WA stands on the world stage when it comes to mountain bike orienteering, with Orienteering WA’s mountain bike convener Ricky Thackray chosen to compete in the World MTBO Championships in Lithuania in August. The Karragullen area was chosen for its good track network, and event areas are frequently rotating to make sure competitors don’t get too familiar with them. You don’t have to be an experienced orienteer to join in the event; the group offers meet and greets at events so the maps and procedure can be explained. There are also different courses so newcomers or juniors can tackle the shortest one first. “Competitors can expect a good physical workout, to see an area of the bush they probably haven’t been to before, to meet some like-minded people, and to learn some map-reading skills,” Ms Post said. For more information, visit wa.orienteering.asn.au.